Slots	Online is now on Twitter, Facebook and available by RSS Feed. Choose your favourite way to keep in touch and stay current with the latest slots news and slots tournaments. 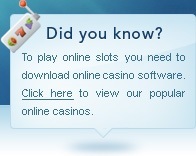 Now that Slots Online is on Facebook, you can become our friend by clicking the "Like" button above! Enter your name & email address to register for our newsletter and receive updates on the latest release online slots, bonus offers & free slots tournaments! If you'd like to contribute to the website, please use our contact us page. Also, feel free to send in an article for inclusion on our blog and feel free to comment on the articles we post.